This classic freestanding vanity unit measures 61 inches across and provides plenty of useful storage space for toiletries and cosmetics. 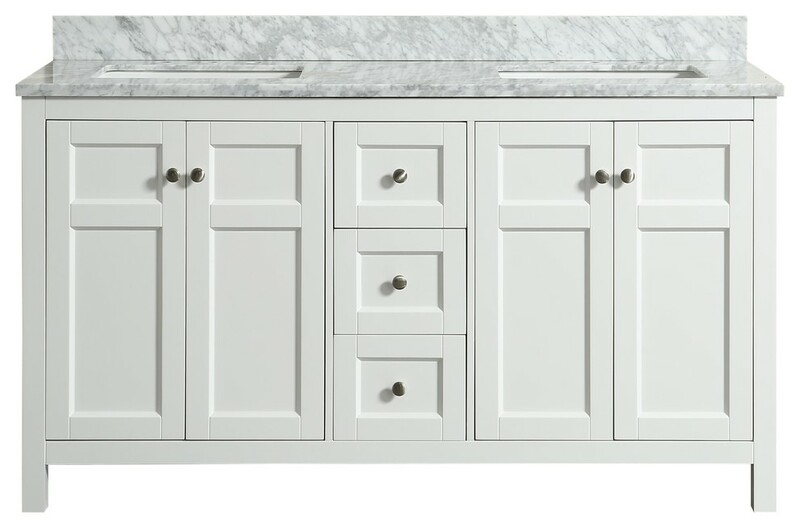 It boasts a gorgeous Carrara marble counter, offset by sleek, brushed nickel handles. The marble used for this vanity has been imported from Italy and is completely natural. Therefore, each countertop will have distinctive veining, markings and color variations meaning that no to pieces are exactly alike. Drawing on a diverse range of design traditions, 1st Avenue offers classic pieces with a timeless character. W 61" / D 22" / H 34.5" / 219.58 lb.